There’s the Olympics. The World Cup. The Extreme Games, but tell me what’s more fun than a Mascot Games. New Hope for Kids along with Stuff the Magic Dragon, mascot of the NBA Orlando Magic, hosted the 21st Mascot Games on July 25-26 at the Amway Center in Orlando. 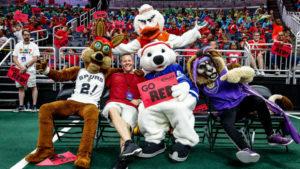 A unique and entertaining concept, mascots from throughout North America participated in the team competition on day one, before 8,500 summer campers.